Lotto Kings gives their players the most convenient way to play and win worldwide lotteries from one website. They are an established company who offer lottery services operating through their own offices and their network of associates. 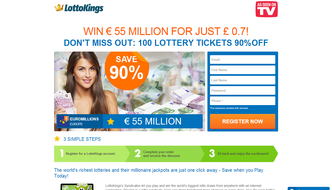 The LottoKings website is owned by Ledonford Ltd who have been operating for more than 7 years with clients in over 140 countries. By opening a new account at lottokings.com today you will get access to their exclusive promotion. 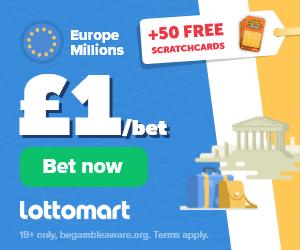 For just $1 / £0.70 you will get 55 chances through 100 syndicated lottery entries to win Europe’s biggest lottery, the EuroMillions. That’s a massive 90% discount on the standard price. Please note that your discount will show up on the payment page before you place your order. 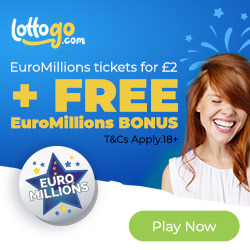 The promotional offer will give you 100 entries over 2 EuroMillions draws. Your subscription will not automatically continue thereafter unless you choose to play more draws. As well as the excellent promotional offer for new players the site is 100% safe, secure and trusted by thousands of players. They make sure that you never miss a draw or jackpot by notifying you well in advance. All your entries are scanned and emailed to you plus a copy is stored in your account area before each draw. When you win a prize you are notified via email plus all winnings are distributed evenly between all members of the syndicate. Your winnings are deposited into your account and you can then choose whether to withdraw them or use them to buy more entries. When playing here you have the choice to play multi-draws or subscriptions. If you choose to buy a subscription you will participate in every draw of a specific lottery using the same numbers. You pay in advance and can cancel the subscription at any time. If you buy a multi-draw package you play the same numbers for either 5, 10, 20, 25 or 52 draws. A multi-draw package will save you money as you will receive a discount depending on how many draws you decide to play. To make a payment you can use Visa, Mastercard or AMEX. Alternatively, you can use JCB, EntroPay, checks, Skrill (Moneybookers), Ukash or bank transfer and your order will be processed once your payment has been confirmed. If you win any amount below $600 it will be deposited to your LottoKing’s account. You can then choose to withdraw it or use it to buy more tickets. If you win any amount over $600 or even the jackpot then you will be contacted with instructions on how to claim your prize.